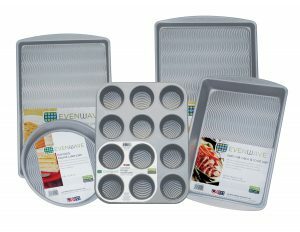 Evenwave™ is an embossed pattern aluminized steel bakeware line, with our reinforced DuraClear™ nonstick coating. The textured bottom increases airflow to help achieve a golden brown result. The combination of the nonstick coating and the textured bottom allows for easy release which makes cleaning a breeze.